We are incredibly happy to announce that we are launching an online shop of the highest performance espresso machine and grinder spare parts through a collaborative partnership with Italy's Nuova Ricambi. As experienced technicians, we understand the function and necessity of each and every component. We are here to sustain the technologies that support your business and drive what we love, fine coffee. Nuova Ricambi was founded in 1980 Carugate in the city of Milan, Italy. In 2006 the company was taken over by Marcellino's son, Marcello Zanesi , who took the reins of Nuova Ricambi with the same passion of his father and with renewed energy. We had the pleasure of spending time with Marcello at the Specialty Coffee Expo in Seattle. For us Nuova Ricambi represents more then a trusted brand it is an international community that fuels the technologies of the coffee industry. 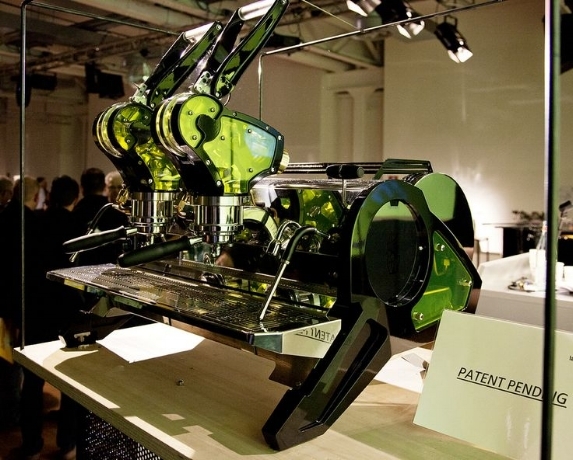 As a direct distributor of La Marzocco, 2009 was an important year. This was the year that La Marzocco entrusted Ricambi with exclusivity of original spare parts in the world. All the pieces came together. We are excited to be part of this community and to become Canada's leading source for expresso machine and grinder spare parts. Stealth Celebrates La Marzocco 90 Contest! Enter to win...! PRIZE: a gift basket which includes: a bag of Matchstick Coffee, a Tamper, a La Marzocco 90th Anniversary shoulder bag, a La Marzocco bottle opener, La Marzocco wrist bands and of course some stickers! And here's the fun part.. Please remember you must follow everyone mentioned to qualify. All entries must be posted by JUNE 30th 2017 at 8pm PST. Good Luck! We will be doing giveaways throughout the year and featuring various local roasters, follow us to stay in the loop! The winner will be announced on Friday July 7th (we appreciate your patience while we verify all the entries). Per Instagram rules, we must mention this is in no way sponsored, administered, or associated with Instagram, Inc. By entering, entrants confirm they are 13+ years of age, release Instagram of responsibility, and agree to Instagram's term of use. The Stealth SCA Coffee Expo Wrap Up! We are back from a very fun, informative and all around exciting weekend in Seattle at the SCA Coffee Expo. Much like past years, this met and even exceeded our expectations. We started off the weekend with the entire Stealth team meeting at the badge pick up...and we were off!! We hit the show floor and walked the grid (in order). We were impressed with each booth and the attention exhibitors had to each detail was striking. Of course one the most attention grabbing booths was the Kenya Coffee Directorate who had such a presence and fantastic cultural display of not only their green coffee beans, but also local Kenyan dance and song. We were blown away and loved the infusion of African culture (the birthplace of coffee). Just a hop and skip away was none other than the La Marzocco booth! 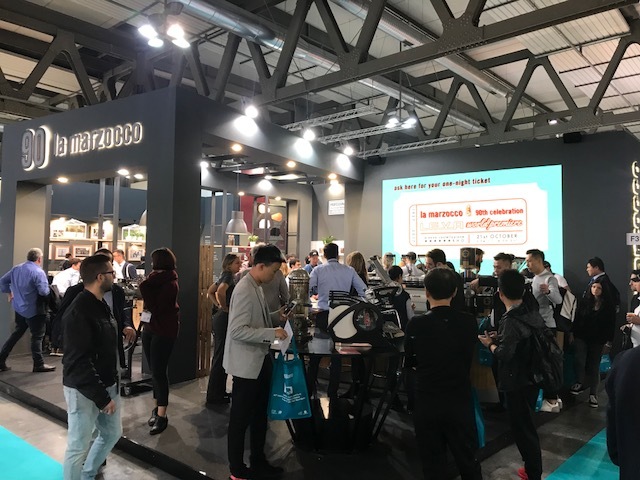 This year, the special aspect was the celebration of the 90th year anniversary of La Marzocco. 90‘s themed swag and signs reminded us that La Marzocco has been present in the coffee industry since the beginning and has come such a long way with design, technology and overall growth! 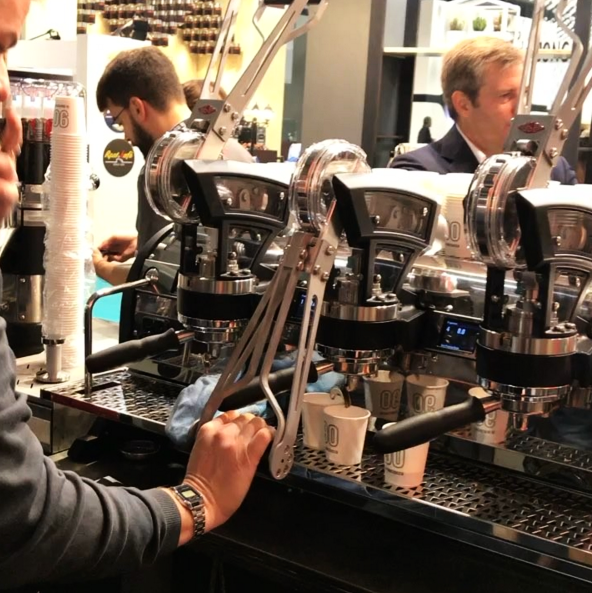 Any coffee expo veteran knows that at a Specialty Coffee Expo, new equipment is unveiled so we were delighted to see the Strada AV ABR - yup, it’s exactly what you imagine. All the specs and aesthetics of a Strada but with auto-brew ratio and scale integration. With a Mazzer grinder set next to the machine, baristas were able to pull their own shots, steam their own milk and enjoy their own cup of coffee. We truly got to experience the machine up close and personal at our own pace. On another side was a Linea PB customized with Songwa Estate logos! This is an important focal point because inspite of producing quality coffee, Songwa Estates (Tanzania) offers the In-Depth Coffee Program in which visitors are educated and invited to partake in process of coffee cultivation. We loved to see the commemorative machines throughout the show floor. Each booth visitor was welcomed by the incredible staff from La Marzocco USA and Italy, and of course left with slap bracelets, shoe laces, temporary tattoos and stickers. This was one of our favorite stops and had us returning often. Happy 90th Birthday La Marzocco! Sharing the back wall with La Marzocco was another one of our favorites, Modbar! With a customized white espresso system and steam system and pour over system and beautifully set up (and exposed) under-counter units the booth looked nothing short of perfect! We were welcomed by baristas, roasters and of course the amazing Modbar staff, with coffee in hand and some incredible chats we bid farewell to Modbar and continued on to our next couple stops... The Marco booth!! Another impressive set up!! Sleek, neat and polished, the brilliant staff (and techs) at Marco set up everything in the way of hot water systems. Towers, under counter units and of course brewers... once again we were blown away! What caught our eye was the highly anticipated and incredible little unit called the Marco Mix system! This incorporates existing Marco technology but with some additions that make this unit unlike any other. It’s highly efficient, very small and sleek but a workhorse in production. We are always impressed with Marco and it came as no surprise when we learned the Marco Mix won the “Best New Product” at the Expo. Great job Marco!! Next on our “hit list” was the Alpha Dominche booth and once we got there we were stunned! Alpha Dominche unveiled their Sight batch brewer. Finally, a nice looking and quite interesting “drip” style brewer for the FRONT of house. Much like the Steampunk, the Sight brewer is designed to utilize full immersion, multiple stacked immersions or standard drip. It doesn’t stop there, the Sight has a parameter control which is linked to an app (compatible with Apple and Android systems) which allows precision and individual involvement from users. Another enhancement is the 8 gallon capacity!! For those who think this is just for coffee...think again! The Alpha Dominche Sight brewer is perfect for tea as well! There really is nothing quite like this and the attendees of the coffee expo were the first to see it. The La Marzocco Auto Brew Ratio technology is impressive to say the least. In order to help every Auto Brew Ratio user reach optimum consistency, we put together some tips for using the Linea PB ABR.